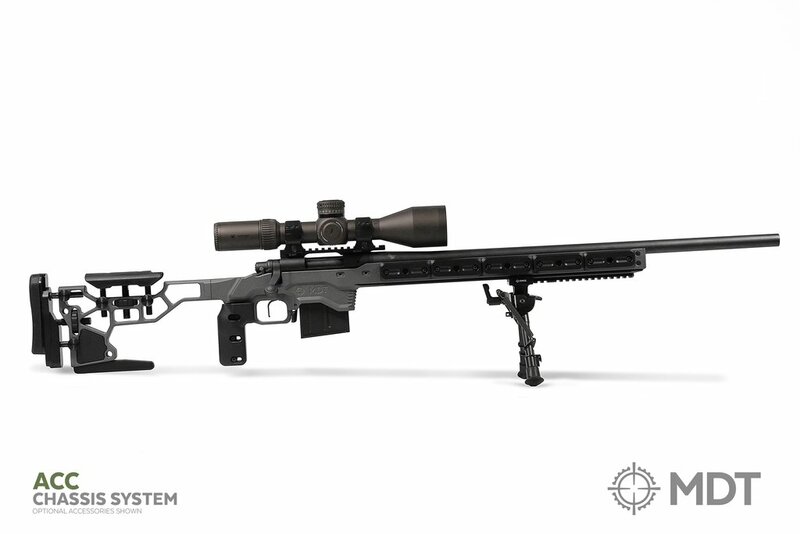 The ACC (keyword A for Adjustable) was created with an integrated weight management system, allowing shooters to fine tune their chassis’ weight and balance point. The adjustability comes from a series of weights that can be added to either the buttstock, interior forend or exterior forend m-lok. It’s original weight of 5.9 lbs transforms into a maximum of 12.3 lbs (chassis only - add on your action, barrel, scope and accessories and most shooters are pushing 25-30 lbs in the ACC). All of this modularity and adjustment can be achieved without taking your barreled action out of the chassis system: internal forend weights can be inserted from the front of the forend and screwed in place, while external weightswere designed to be M-LOK compatible and easily attached on either side of the forend. This ACC weight management system allows shooters to rapidly adjust the feel and recoil characteristics of their system, even while at the range. Along with other features like the full 17” ARCA/RRS forend, flared magazine well, extended barricade stop, widened thumb shelf, adjustable cheek riser and length of pull - the Adjustable Core Competition chassis is nothing short of excellence for the competition shooting world. The ACC chassis is designed to accept an ESS compatible buttstock, with a few modifications to provide extra weight and solid lockup of adjustments, whilst still being tooless. The MDT Vertical Gripwas designed at the same time as this chassis and is built for the competitive shooter.